PetalBerri products are proudly made in Adelaide, Australia by Aimee. I am really into accessorising more this year and I couldn't wait to try these beautiful handmade products. The packaging is so cute and the range of fabrics that Aimee sources for her designs are very unique, I think there is something for everyone. I wore one of my favourtie vintage dresses as I thought that it would go perfectly with the red theme! The matching earrings are such a great touch though, I love pretty little details like that. The headscarf and earrings are really well made and very affordable. I've had this vintage dress for a couple of years now and it is so comfortable. I like that I can dress it up a bit or just wear it quite casual with flats and my hair back. The detail on the skirt is so pretty and I love that chambray fabric is very practical and long lasting. I was lucky to pay under $20 for it too. 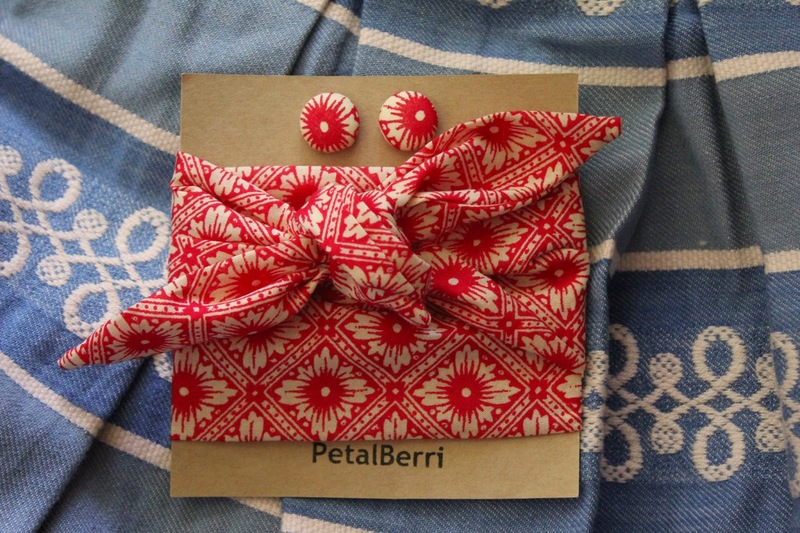 You can find PetalBerri on their website, Esty, Facebook and Instagram. Beautiful outfit! I love the pairing of soft chambray blue and classic lipstick red together as you've done here. They're fresh and timeless in the same go.